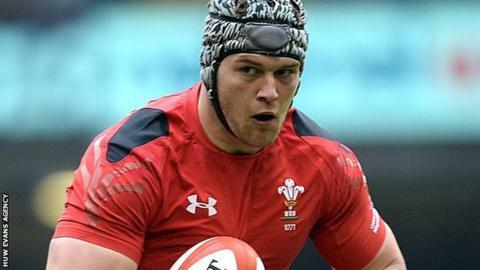 Dan Lydiate says he has improved since returning to Wales with Ospreys from Racing Metro in France. The Wales flanker, 27, cut short his stay in Paris in December 2014, signing a national dual contract with the Welsh Rugby Union and Ospreys. "Coming back here, I feel I'm starting to move forward again," said Lydiate. Lydiate says some stars like centre Jamie Roberts, 28, whose future at Racing is the subject of debate, can benefit by playing outside of Wales. Yet in his case, Lydiate left Newport Gwent Dragons in 2013 for Paris hoping to improve, but he felt that did not happen. He said: "I went out there to play with new players and a different standard of rugby, but, at the end of the day, I wasn't being picked. "On the rugby side of it, my rugby didn't move forward and that was a big thing about me leaving the Dragons. "I wanted to progress as a rugby player, not stand still. "Coming back here, I feel like I'm starting to move forward again now. "At least I will know I've tried it, I'll never be left wondering 'What would it have been like if I'd gone out there?'" However, Lydiate, who has been capped 46 times by Wales, says other players can have more rewarding playing experiences. "If you find the right club and the right match for you, then I think it's brilliant for players," he added. "It obviously wasn't the right match for me, but I can only speak for myself." Roberts has agreed terms to join Harlequins in the Aviva Premiership from Racing Metro and ex-Wales captain Gwyn Jones says it is a test of "Gatland's Law". Under Wales' selection criteria Wales-based players are likely to be favoured for Test selection over those who choose to play elsewhere. Lion Roberts, 28, and Lydiate were Racing team-mates before the latter's departure. Fourth-placed Ospreys host leaders Glasgow in the Pro12 on Friday, hoping to enhance their chances of a home play-off semi-final.